There’s no need to buy expensive paint crackling medium, only to have it dry up before you can use it all; just use the cheapest off all glues, used for decades by children in art class, and now as a crackling medium. 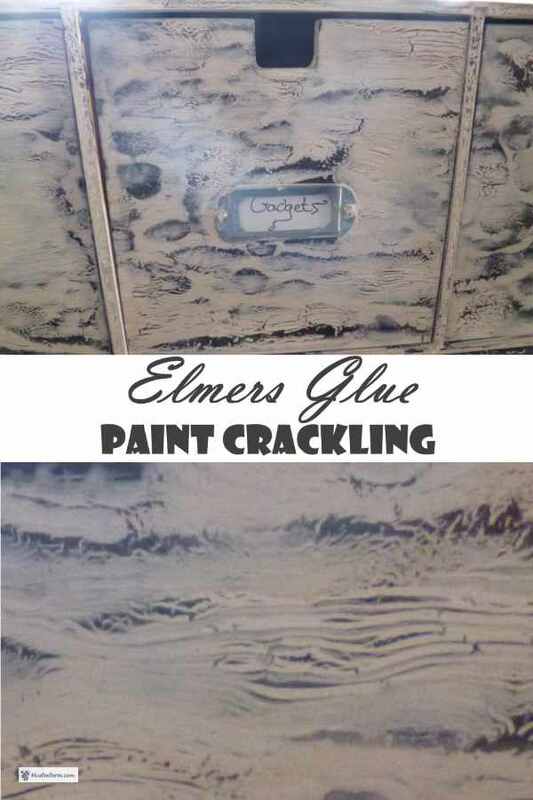 Elmers Glue is a white water soluble glue, which makes it easy to clean up before it dries, but it’s quite durable. 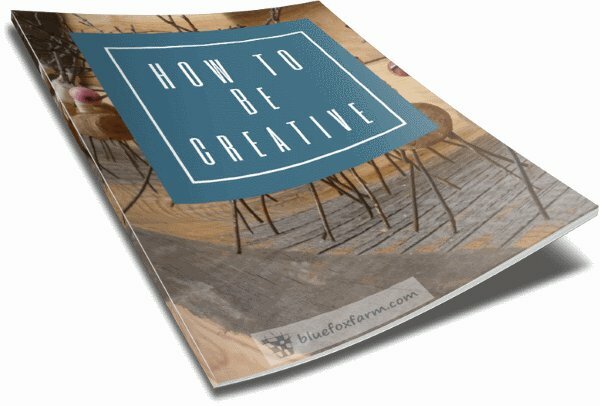 Using it as the middle crackling layer to give you that aged and antique look to rustic crafts, furniture and other household items can save you a bundle of money. 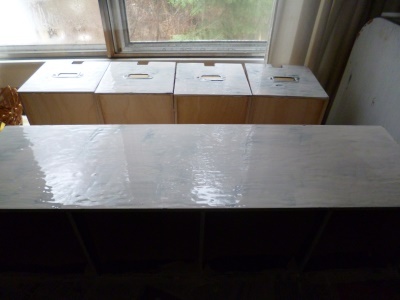 So, to start your project, do what I do; train your friends and family to find and retrieve old painted boxes, little drawers, cupboards and shelves. These should be wooden for the best results. Wash well with a damp cloth and TSP or Trisodium Phospate, or other degreaser. 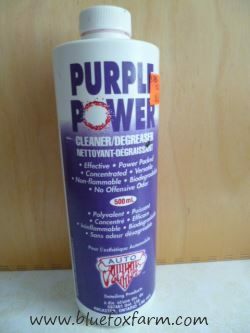 I like Purple Power, but there are a lot to choose from that do the same job. It’s important to remove grime and grease especially. After this, you can sand the piece down if you like. Sometimes damp ragging a wooden piece can raise the grain, and it needs to be sanded with fine garnet sandpaper to take off the rough edges. A piece that is already painted needs to be sanded to give the next layer of paint something to ‘key’ into or bond to. 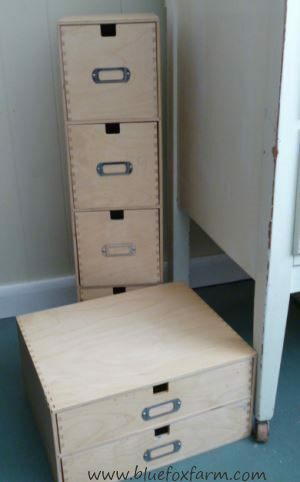 I use cheap acrylic craft paint for smaller items, or you can buy a quart (liter) of white paint in the hardware store (wait until it goes on sale). Make sure you get latex interior paint, which cleans up with water. Don’t use the oil based paint which are harmful to the environment and the artist, and have to be cleaned up with turpentine or mineral spirits. 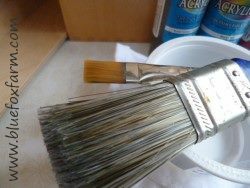 Using a 1-2” natural bristle brush, give it the first coat of paint. I like to use a darker color – shown here, a mixture of black, burnt umber and holiday red. This makes a lovely dark raspberry color. Other favorites are black mixed with blue and yellow, which makes a really dark green. Learn how to make different colors with what you have; all of the colors of the rainbow can be made from different ratios of red, yellow and blue, and you can make them lighter or darker by adding white or black. The technical aspects of painting the first coat are not important; just cover the item. Brush marks, thin spots and other flaws are not an issue (do, however, get rid of drips, because you’ll never be able to cover them). Allow the item to dry and then using the same size brush (cleaned under warm water with dish detergent or soap right after you finished using it, of course) dab on Elmers white glue, diluted with a small amount of water. It’s important not to get it too thin, but it needs to spread easily. Allow to dry for up to half an hour to an hour. 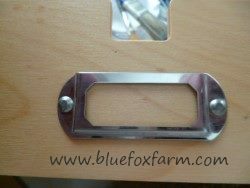 Drawer pulls or other add-ons like this label holder are fiddly to paint around; use a small brush. 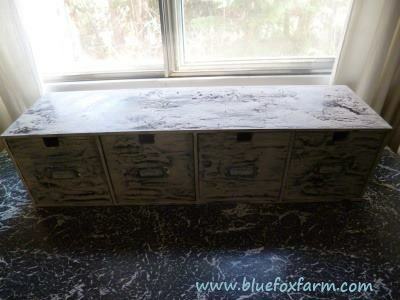 The top coat will usually be a paler color; white or off white works great for a rustic shabby chic look. 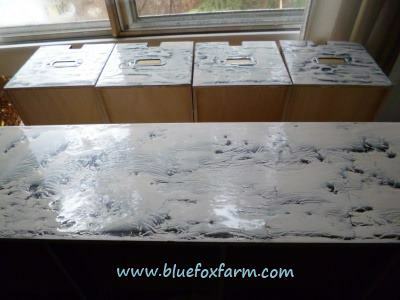 Mix your paint in a yogurt or cottage cheese container, and try and judge the quantity of white paint that you will need to cover the project. Add a small amount of a darker color, like the burnt umber, brown or beige to give it more of an antique white tone. Only mix the amount you will need, as it doesn't keep. Add a few drops of water to dilute it to spreadable consistency, and paint over top of the now almost dry glue layer. Make sure that you don’t attempt to touch it up, because that will pull the glue layer up, and make a mess. As the two layers continue to dry, the crackling will start to show, and depending on the thickness of the glue and how much moisture was still in it when you do the top layer, it will crackle more or less, showing thicker or thinner cracks. The undercoat will show through, which is why you want to use the darker color. The first coat of paint is a dark color, allowed to dry thoroughly. The next layer is diluted Elmers Glue painted on in broad strokes. Allow the glue to dry for a few minutes; paint over it with your choice of top coat. I mixed my favorite antique white. The paint is starting to crackle; full effect shows in about a half an hour, but leave to dry thoroughly. 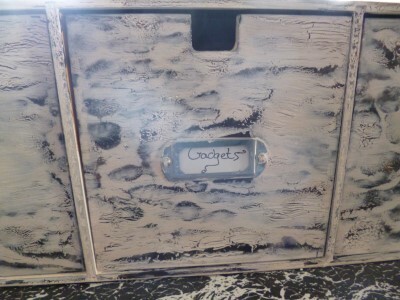 The completed project - very interesting texture with the darker red paint layer showing through. Allow the paint and glue to dry completely before handling it; don’t attempt to touch it up, as the paint will no longer crackle once the glue is completely dry. If it didn’t work, sand it off, and try again. 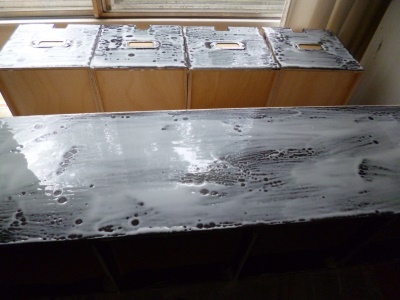 I recommend using a trial piece or two, of similar textured wood to test the consistency of the glue and the paint before getting too anxious to try it on a bigger piece. 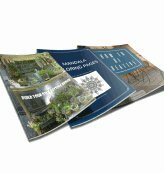 To give the piece a final protective layer, I like the sprayable Varathane product, Diamond Coat, which can be either gloss, satin or matte finish. My preference is the satin, to give it a bit of a glow without making it too shiny and fake looking. 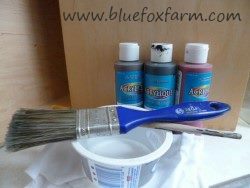 Later; I started using the paint on Varathane - see the link below to purchase it. Several light coats are better than one heavy one; I’ve used this on some of my painted doors which are out in all weather – they have lasted for 6-7 years with no sign of needing repair after using the Diamond Coat. Rust-Oleum Varathane Interior Crystal Clear Water-Based Poleurethane, Satin Finish . Premium Painting Brush Set-12 Piece Golden Synthetic Hair, Short Wooden Handle Artist Paint Brushes for Acrylic, Oil, Watercolor Painting . Apple Barrel Acrylic Paint Set, 18 Piece (2-Ounce), PROMOABI Best Selling Colors I .